Just because summer is over - doesn't mean you have to miss out on the fun at Sesame Place! My little family and I got to experience their Halloween Spooktacular first hand. It was a super gorgeous day that we loved speding at Sesame Place. Although, I was kind of sad to see the water rides and knowing that summer really is over! Boohoo. But the BooHoo carried over to the BOO! The best thing we did was enjoy the decorations. I absolutely LOVE their little bits and pieces of the season all over. It was fun to see the pops of Halloween everywhere! 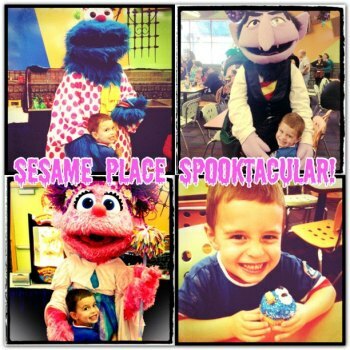 Grab your family and take a trip to Sesame Place for something different this Halloween. Pumpkin patches and hayrides are great-but this is something definitely different for your family! New in 2012 is Ernie’s Rubber Duckie Costume Party - a non-stop, fun-filled time, where everyone’s invited to dance their day away! Moving lights and fun, upbeat music will make you feel as if you’ve arrived at a Sesame-styled disco. Back for its 2nd year is the Neighborhood Street Party Halloween Parade. The entire parade takes on a not-too-spooky-feel from candy corn in Cookie Monster’s cookie Jar to Bert and Ernie dressed as a rubber duckie and a pigeon for Halloween. The last parade stop features “spooktacular” music and performances by the Sesame Street characters and is not to be missed.